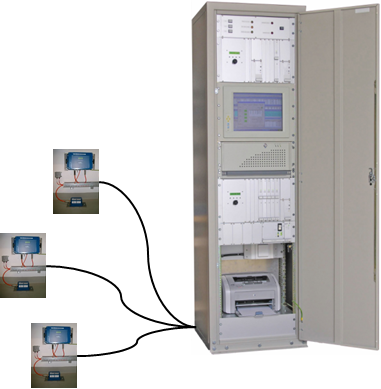 The SMS/SAS systems are mostly used in Nuclear Power Plant or other Industrial Facility Seismic Monitoring Projects. If you need any further specific information, please do not hesitate to contact us through our agent assigned for this kind of instrumentation for your geographical region or directly. 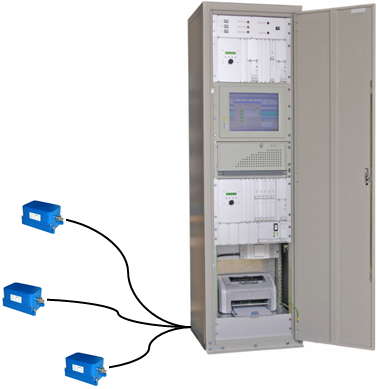 The core of the SMS / SAS is a Central Processing Unit (CPU) with a multi-channel digital recorder system rack mounted in a seismically and EMC safe cabinet together with an industrial PC and relevant peripherals. Accelerometers, seismometers or complete seismic station packages, which are referred to as Detection / Recording Units (DRU's) are placed at remote locations that are connected to the CPU through shielded or fiber optic cables. The system has been designed in a way that it is not bound to a single topology. There could be only the sensors or both sensors and data acquisition out in the field. GeoSIG, unlike any other supplier, can offer three different and versatile solutions for the seismic instrumentation of industrial facilities. Please see the images on this page for an overview of these topologies. One is the Decentralised System, where each measuring point has a seismic sensor together with a dedicated recorder and there is a system central controlling the overall operation and providing system intervention and maintenance. Second one is the Centralised System where only the seismic sensors are located at the measuring points and all other functionality are provided by the system central. And finally the Cascaded System, which is a combination of the decentralised and centralised systems to provide a more flexible deployment. The system has a great modularity and flexibility so that an instrumentation upgrade is simplified and that as much as possible existing elements can be reused. 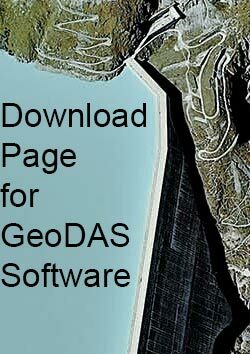 State of the art GeoDAS software is utilized in the CPU. GeoDAS monitors all DRU's in parallel, as a result of the dedicated serial communication links that are provided by the system hardware. 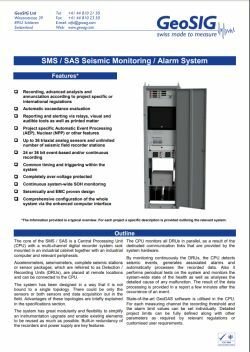 By monitoring continuously the DRU's, the CPU detects seismic events, generates associated alarms and automatically processes the recorded data. Also it performs periodical tests on the system and monitors the system-wide state of the health as well as analyses the detailed cause of any malfunction. The result of the data processing is provided in a report a few minutes after the occurrence of an event. For each measuring channel the recording threshold and the alarm limit values can be set individually. Detailed response spectrum limits can be fully defined along with other parameters as required by relevant regulations or customized user requirements. SMS/SAS system offers the most flexible sensor connectivity options to cater for the needs of any measuring requirement. Any matching type of sensor can be connected to the system. GeoDAS software provides various analysis functions like filtering, FFT, response spectra, etc. Other commercially available evaluation software packages may alternatively be used. GPS System accuracy < 1 msec. Permanently active, self monitoring and user selectable, periodical system test including comprehensive sensor, memory, filter, real time clock, battery level and hardware tests. The warning option provides independent warning / error outputs (relay contacts) based on user selectable criteria. As separate acquisition module in the CPU with its own power supply, remote sensor and cable; or independent DRU’s with integral relays and CPU connection. 19’’ cabinet in different sizes, floor standing or wall mounted.